Robert Bennett joined Classic Cake in December 2005 as Executive Chef. In this role, Robert is the creative driving force behind the company’s product offerings and introduces unique, customized desserts and confections to the commercial market. Robert’s oversight also involves the daily operations of the bakery, and he is responsible for ensuring the company’s high quality product and service standards. 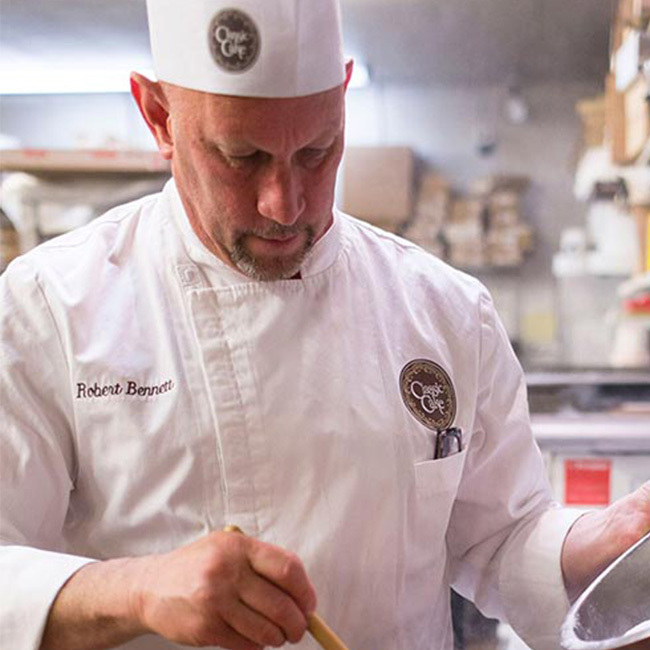 Robert Bennett has shared his culinary passion through work as a creative chef, teacher and owner. Upon graduation from the New England Culinary Institute (NECI), Robert began his career as an Executive Pastry Instructor at his alma mater. 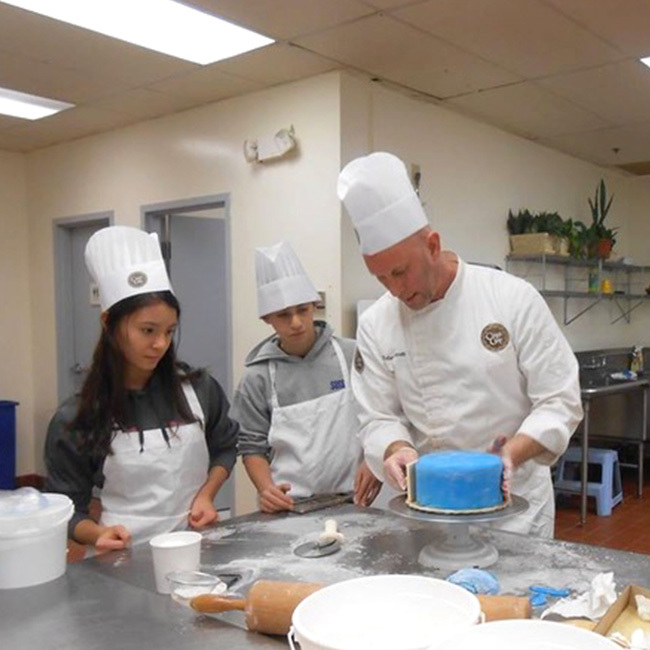 He was catapulted quickly into the worldwide media in January 1985 for being appointed the Honored Pastry Chef for President Ronald Reagan’s second Inauguration, leading a small team of NECI students to prepared a cake for 44,000 guests. Robert moved on to the position of Executive Pastry Chef/Consultant at the Jumby Bay Resort in Antigua, West Indies before coming to Philadelphia, Pennsylvania in 1987 where he was hired as Head Pastry Chef at Le Bec-Fin. He proudly worked under the guidance of famed Chef Georges Perrier for more than a decade. In 2001, Robert stepped out on his own and opened Miel Patisserie, a chic boutique-style pastry shop in Cherry Hill, New Jersey and Center City, Philadelphia. Over the years, Robert competed in numerous competitions worldwide and in 1989, he represented the United States in the premier World Cup Pastry Championship in Lyon, France. Since retiring from competition, he has served as a judge for the United States Pastry Competition in New York. An active member of the culinary community, Robert was one of the original members appointed to the Board of Directors of the North American Pastry Chef’s Association. He is co-founder of the Philadelphia Pastry Society and was honored by NECI with their “Distinguished Graduate Award.” Robert is also one of the founding chefs of Chef Aid, which has raised millions of dollars over the past decade. An international chocolatier, he was named U.S. Ambassador for the Barry-Callebut Chocolate Company in 2003 and was the U.S. Judge at the 2005 World Chocolate Master Championships in Paris, France. Robert was privileged to receive the ACF Pastry Chef of the Year award in both 2015 and 2016, the first awardee to have received this honor two years in a row. Robert has become a regular on local, national and international media, including in July 2010 when he and the Classic Cake team were featured on TLC’s Fabulous Cakes. 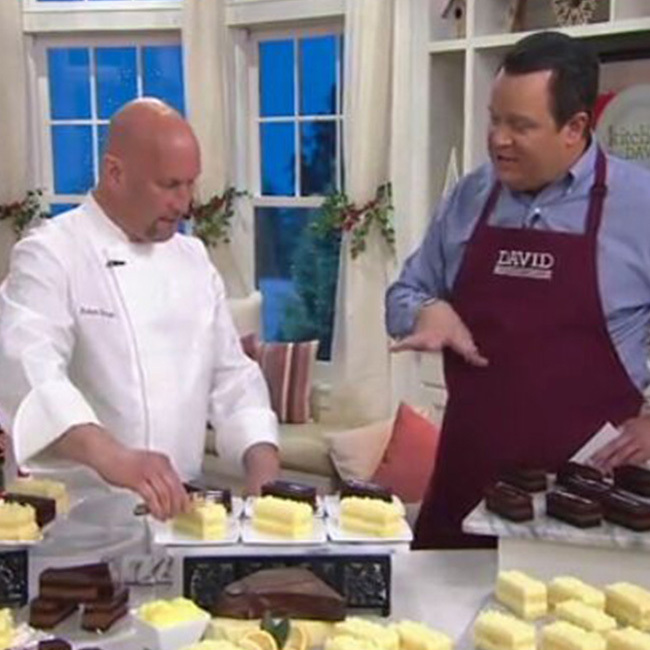 Most recently, Robert has had eight appearances on QVC, selling Classic Cake pastries on such popular shows as “In the Kitchen with David” and “Christmas in July”. In 2017, he traveled to Seoul, South Korea for several airings on the CJO Shopping Network where he featured Classic Cake’s own Philadelphia cheesecakes. Closer to home, Robert was proudly named one of South Jersey Magazine’s “Men of the Year” in 2011. He holds a strong commitment to the community as a whole, donating his time and dessert specialties to more than 30 charities each year, including Susan G. Komen Race for the Cure, JDRF of Southern New Jersey and the Katz JCC in Cherry Hill.